My daughter with our neighborhood ice cream truck. out the window as I ran to see what was wrong and found kids scrambling everywhere – all frantically running back home. Guess what the problem was?The ice cream truck was headed down our street! Catchy high-pitched music ringing, promises of a cool treat for just eight quarters, and that slow drive through a neighborhood subdivision on a hot early fall afternoon. It struck me….. I know we’re not all selling ice cream treats to 6 year olds on a hot day. (It doesn’t get any easier than that!) 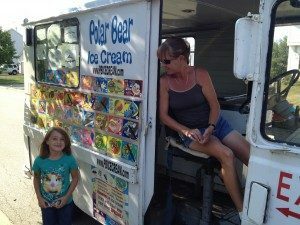 We can, however, all learn a little about marketing hearing aids from the tactics of our neighborhood ice cream driver. If that same ice cream truck comes down our street a half hour earlier, there’s nobody around to notice because the kids aren’t home from school yet. It was no accident that the ice cream shows up 10 minutes after the bus dropped off 20 grade-schoolers on our block. Someone carefully planned that route in order to take advantage of catching kids when they are outside. A lesson in perfect market timing. Market timing is critical to any successful hearing practice direct mail campaign. In fact,when you mail can be just as important as what you mail! In the Aging Adult market, we have found that if mail hits mail boxes on Saturday, our response rates suffer. People just don’t seem to pay attention to what’s in their mailbox on the weekend as much as they do during the week. So until the USPS eliminates Saturday deliver, you’ve got to manage the drop schedule very carefully to avoid Saturday delivery. What if the ice cream truck came along every day? It wouldn’t be a special treat anymore. Part of the excitement is the fact that the event does not occur too often. The kids know if that truck passes by, it might be a while until they’ll see it again. Similarly, frequency plays a huge role over the long run of any successful hearing aid direct mail plan. It’s important to develop the right frequency and mail a quantity based on the size of your territory. If you mail too often, you could actually be hurting your response rates as people realize that you’ll have another offer arriving soon. And if you don’t mail frequently enough, you could be losing out on catching Aging Adults when they are looking for special offers on hearing aids! Another genius thing about the ice cream truck is the fact that it moves away slowly. You’ve only got seconds to drop what you’re playing, get your piggy bank (a.k.a. Mom or Dad), and sprint down the street to catch the truck before it drives away. Now that’s “hair-on-fire” sense of urgency at its finest! Mail is direct-response advertising. Meaning, we need to incite enough sense of urgency to get someone to drop what they are doing, walk outside their comfort zone, and make a phone call. Why does every major store run sales and events? Because they work! A limited window to respond effectively motivates people to do something right away or risk missing out on an opportunity. Making the window just the right size is critical. If your window is too small, then your proverbial truck will drive away before people have time to respond. If it’s too big, then there is not enough sense of urgency to trigger a response in the first place. This is another reason to be mindful of when your hearing aid direct mail will hit mailboxes prior to your event. The second you hear the music of an ice cream truck, you know what’s coming around the corner. Some might call it brand recognition, but top-of-mind advertising IS a little more intentional than a branding strategy. We need something that people will remember you by so when the time is right, they think of you right away. Will your hearing aid patients think of you when a friend tells them he or she thinks they have a hearing problem? Will physicians in your town think of you immediately when a patient needs hearing aids? If not, then you might consider creating a simple strategy that sets you apart from your competition such as a patient newsletter, patient referral program and working on your physician referral network for your practice.